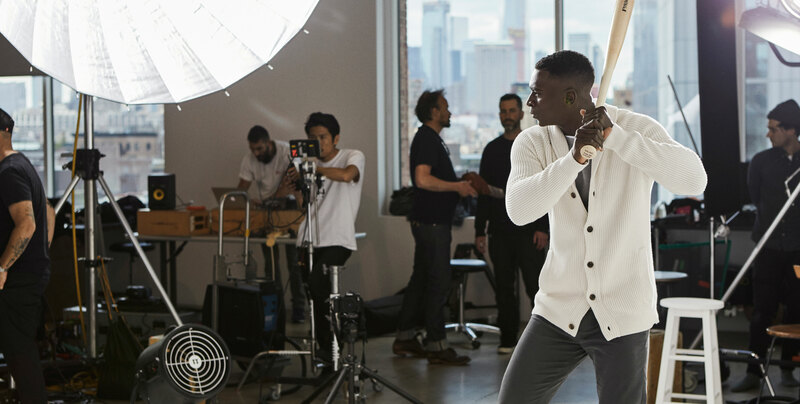 Nobody knows prime performance like professional athletes, so we teamed up three of our favorite stars from football (Matt Ryan), baseball (Didi Gregorius) and basketball (CJ McCollum) to test our newly launched and built-to-win Rapid Movement Chinos, hot off the heels of our popular Rapid Movement Denim. Would these pants keep up with these superstars? The answer is a definitive hell yes. Even better, they propel them forward in true comfort, from sunrise to sunset, no change of wardrobe neccessary. We spent some QT with the guys in our New York studio to talk sports, performance and their defining style. Matt, what do you think of our new Rapid Movement Chino? They are versatile, perfect to wear for any occasion, day or night. Absolutely. They’re built to out-perform the average chino as we know it. What does ‘performance’ mean to you? Performance is about getting the best out of yourself that day. Every day, you’re a different version of yourself, right? Some days you feel great. Some days you don’t. But whatever you feel like, you just have to get the most out of you, that’s what performance is all about. True story. Tell us, how long you’ve been football-ing? A long time. A lot of seasons. Since second grade. This year will be my 10th season playing professional football and with the Falcons. You know, obviously we didn’t win the Super Bowl this past year, but I think it’s going to be a springboard for us moving forward. Everybody’s motivated and wants to get back there and win it. How is quarterback different than any other position in sports? Because regardless of your personality type, you’re automatically in a leadership position. I try to motivate through my actions and set an example for the other guys. I try and work hard and be supportive. You know, help guys whenever I can. Do you have favorite places to play on the road? Green Bay. It’s just kind of old school. It’s got a lot of history there. It’s like one of those stadiums that has been around forever and when you go, you just kind of feel like there’s a lot of history to it and the fans are really good. It’s just a really unique and cool place to play. What’s your all-time style essential? A good, comfortable T-shirt is a nice staple. You can dress it up. You can dress it down. What else is in your closet right now? You’ve got your suits. Your casual clothes, sneakers, belts, ties, and then, I have hats. Lots of baseball hats. My day-to-day wardrobe is shorts, a T-shirt and a hat and I’m out the door. 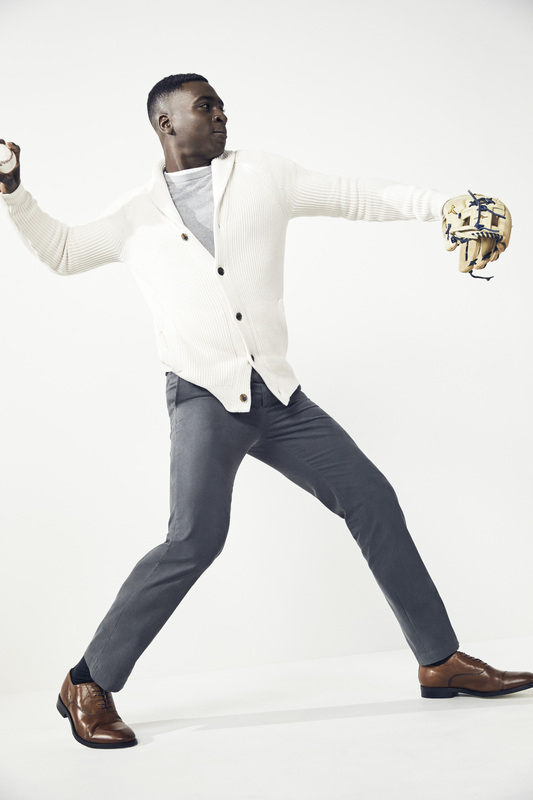 On Matt: Military Jersey Crew in goldrush, Lux Stripe Tee in grey sky, Aiden New Stretch Chino in Airforce khaki. What’s one trend you wish you’d never tried? Probably the big pleated suit pants, you know, like back in the day. They were pretty terrible. Or the really skinny stuff. My legs are not built for skinny jeans. I feel like we’ve all tried to squeeze into something a little too tight once or twice, yeah. I’m not superstitious or anything like that, but I like to have a routine and eat at the same time, and kind of eat the same things. For breakfast, it’s the same meal I’ve eaten for probably eight years prior to games. 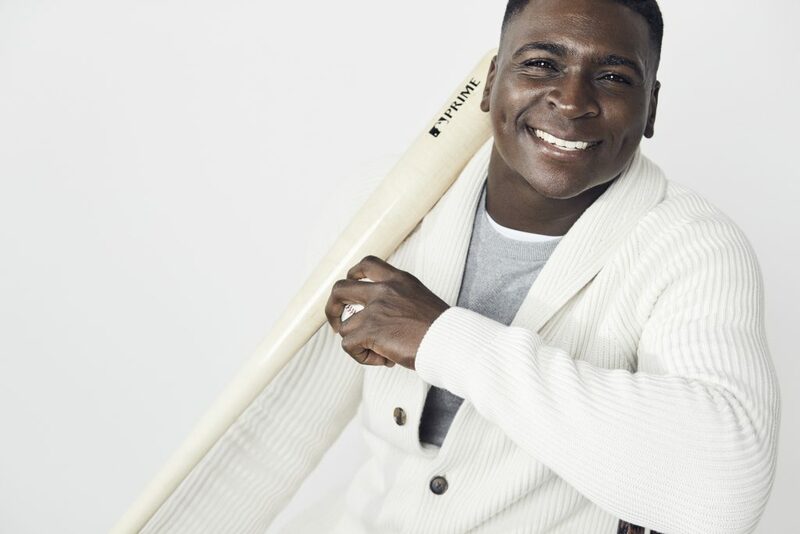 “So comfortable and easy to move in—I was a fan instantly.” –Didi Gregorius. What’s your mindset when you walk out on the field? You’ve got to play your heart out. I always rub the dirt with my right hand, and then I wipe it off on my pants. It’s my way of telling the field to treat me right today. I think baseball is more mental than physical because you can easily break yourself down and say, “Oh, I’m not doing well.” And then before you know, you’re dragging for a week or more. But you want to stay positive. Once you accept failure, that’s how you make the next step to go to the bigger. On Didi: Aiden Chino in charcoal, Supima Ribbed Shawl Cardi in stone, Pique Crew in Sidewalk grey, Basic Cotton Modal Crew in white, Kevin Cognac Shoe. Did you always want to be a baseball player? It’s a family thing. But I also wanted to study to become a doctor because I’m very caring. My mom plays softball and my dad plays baseball, so I’ve been on the field since I was two years old. What are your favorite fields to play on? Coors Field and Miami so far. Coors Field has that mile-high air, which is different. The ball flies for a little bit. And, of course, Yankee Stadium. Playing in New York, the fans will let you know right away if you do something wrong, and they’ll let you know right away if you do something good. They’re the ones that kind of push you in the right direction. Like yesterday, there was a ball that went to the stands, and the whole stadium was chanting “Der-ek Je-ter.” I started laughing because the reason why they did it is because he ran into the stands and caught a ball and ended up getting cut. What’s it like, role-modeling in the public eye? When a kid tells me, “I want to be like you,” I’m like, “No, I want you to be better than me.” He’s like, “How?” I say, “Just work. If I can work, you can work, too.” The next generation’s going to be better because they keep working, so everybody’s going to help each other to get better. What are your style go-tos? I have a huge watch collection. I like wearing joggers. I like slim-fit stuff. People tell me a lot of time, “You’re tall. You should wear slim-fit clothes,” so I’ve been doing that and it’s been … I feel comfortable. I feel nice. 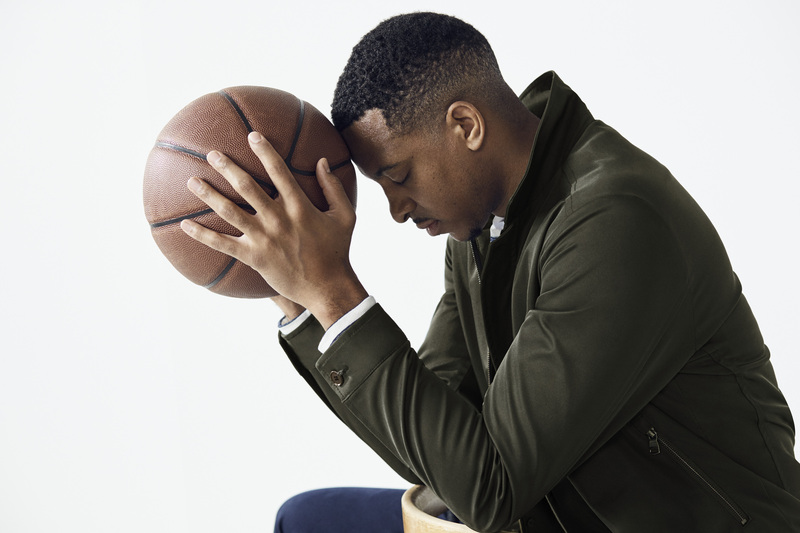 “Tees, polos or button-downs, these chinos work with everything else I already own.” –CJ McCollum. 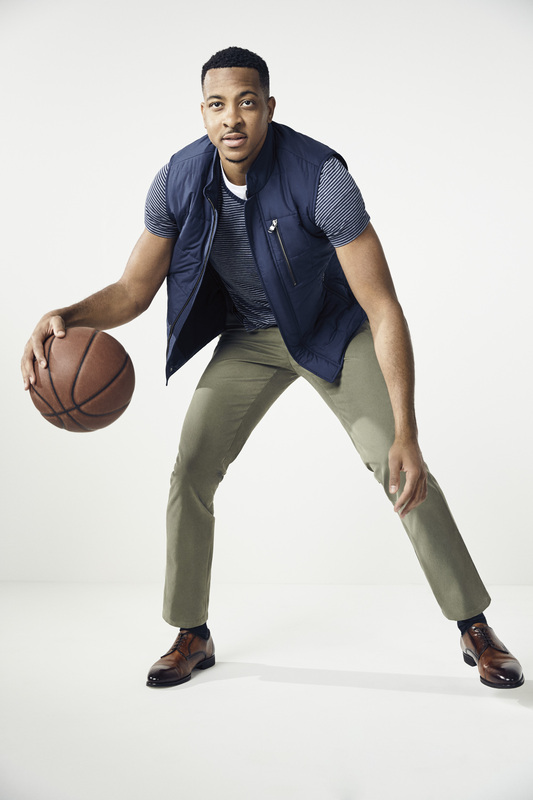 Shown here: Mason Tapered Chino, Puffer vest in preppy navy, Multi Stripe Tee in black, Chino, his own shoes. You and basketball—there’s a long history, right? I was sleeping with the ball in my crib. I always wanted to be a professional basketball player. Growing up, I was huge fan of Allen Iverson. I wore number three. I had the braids and everything. Then Kobe Bryant, Michael Jordan, and my brother who plays professionally overseas—they were the most influential. Where do you love to play most? In New York just ‘cause the Garden, the bright lights, the history … there’s something about that atmosphere. Does all that noise from the stands ever get distracting? You hear the opposing fans when you want to. It’s nice to hear the boos sometimes. They’re really loud and then they get quiet, because it’s like, “Oh, wait a minute, we might actually lose.” So that makes it a lot more fun. What’s the best coaching advice you’ve ever received? Understand that whatever you’re good at you, you need to focus on that. Then continue to try to get better at it. Motivation comes from within. For me, it’s about just being able to try make ‘art’ on the court, and trying to make the game look easy and have fun … and win. What does it feel like when you’re at the top of your game? It’s hard to describe. It’s like you’re living a dream. Everything’s going right, your life is going well, you feel good, you’re healthy, you’re moving well, the crowd is on your side if you’re at home and they react to everything you do. You’re like the leader of an orchestra. Like, if you want them to stand up, you can get them to stand up. So it’s a unique feeling. So you’re on your break now, any travel plans? I’m going to Spain next week—bucket list, check that off. Every year, I try to go see my brother wherever he is in Europe. Turks and Caicos, that’s a bucket list destination for sure, so I’m looking forward to doing that. I’m going on safari in Africa, which is going to be dope … and Ethiopia. Oh, I’ve got a lot of happy places. In my bed is a happy place, because you know sleep’s coming. The couch is another happy place because you might sneak a nap. The kitchen is a happy place, because you know the food is on the way. The court is my happy place just because, no matter what’s going on in life, nothing else really matters for that hour or two hours of the game. Even if you just go shoot free throws, it’s like a safe space for me that I’ve always had growing up no matter what was going on. There’s always an escape when you go on the basketball court. Hot yoga is my happy place, too. They say you sweat out all your sins. You improve your flexibility, core strength, back strength. I love me some hot yoga. On CJ: Emerson Chino in preppy navy, Stripe Terry Crew in cream, Cabot Short Zip in olive.